I was going to bellyache about the weather today and count up how many times I’ve got wet. 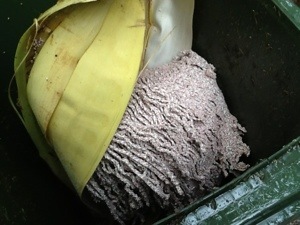 Especially that bit where I had to chop off a giant seed pod that was a good six metres up an Alexander palm in the back yard, if you leave those things they go everywhere. As it was, it nearly crushed the dog, my aim is shocking. But I have friends doing Coastrek today, walking 50 kilometres to raise money for the Fred Hollows foundation, and they were probably so wet that they may as well have done the trek in the sea, so I really don’t have anything to complain about. 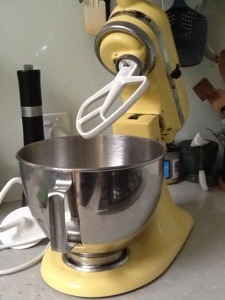 I’ve been meaning to tell you about my KitchenAid. For most of my baking life I’ve been happy to use a fork for all my beating, creaming and mixing needs. A fork has a multitude of other uses and creaming butter with one builds up the forearms, because you need to swap arms every so often when you cramp up. But last Christmas a friend was looking for a new home for her old KitchenAid because the bowl had started to come loose when making bread. I’m perfectly happy to knead my bread by hand, so offered to love and care for it until the end of its life, hopefully many years hence, and she got a new one for Christmas. I approached it warily. I found it a spot on the bench where it wouldn’t get in the way, it was far too heavy to be lugging it out of a cupboard every time I wanted to use it. At first I only used it to cream butter, a job it does quickly and efficiently. But the butter creaming brought a small problem, and that is because I’m finally using properly creamed butter, it has affected the texture of the biscuits I use it in. With a bit of trial and error I’ve found that I should reduce the amount of butter by about five grams. Sometimes a bit more, but that seems about right. Finding that it did that job in a workman like manner, I started letting it mix in flour, beat eggs and soon it was doing the lot. The paddle and bowl go in the dishwasher, there are a good range of paddle speeds and there’s something hypnotic about watching it cream cold butter. Which is another plus, a dough made with cold butter seems to be easier to work with. It has meant that if there is only an hour to go before school pickup I’m much more likely to make biscuits or muffins for afternoon tea, it is really great to be able to just chuck in the ingredients. I’m also more likely to make more technical recipes, it does all the hard work and I just prepare the ingredients. But now I want a second bowl, wouldn’t that be great for making sponge fingers? Yes, I know they’re only three dollars fifty for a packet at the IGA, but I want to see how much better homemade ones are, and anyway we shouldn’t be eating food that’s had to come half way around the world. Apart from Harmonie butter. I’m looking at some on Amazon, they’re a hundred bucks if you buy them here. I don’t think I would have bought one for myself, they are eight hundred dollars. Having said that, I am using it nearly every day, so it would only be because I didn’t know what I was missing out on. Isn’t it beautiful? I thought about making something special with it for the previous owner of this machine, but she’s a fabulous cook, so instead I’ll get over and sponsor her on Coastrek and hope she doesn’t dissolve completely during her ordeal.